How Clean Is Your Record Collection? 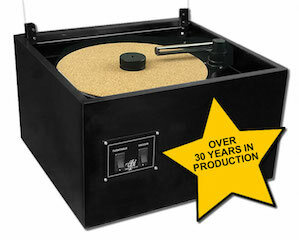 Clean your vinyl records at The Listening Suite using VPI Industries superb record cleaning machine the HW-16.5. 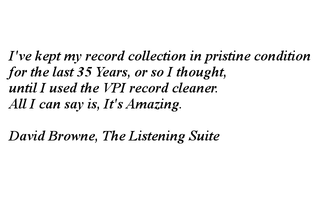 The charge for cleaning 12" LPs is €3.00 Euro per record Self Service and €6.00 Euro per record Serviced. “Self Service” is where you operate the machine, “Serviced” means we operate it for you. Most customers pay €6.00 Euro to see us clean one record, basically to see how it’s done, then clean the rest themselves at €3.00 Euro per record. Record cleaning is strictly by appointment only, with a maximum of 12 records in any one session, (which takes approximately one hour). Replacement record sleeves are not included.